Being considered to be one of the top-rated travel fairs and the biggest market platform for various segments of tourism agencies in Malaysia, it presents & offers different kinds of fascinating & comparatively cheaper travel packages and promotions particularly targeted for travelers in the 2nd half of the year. And it is being projected that over 70,000 people or visitors could attend this year with the target gross sales of RM35million. With the assistance from several tourism related sponsorship and endorsements organizations, this years of fair would feature more than 70 exhibitors with over 350 exhibition booths represented by various travel agents, tour operators, state & national tourism organizations, different airlines, etc. 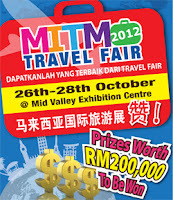 Do you like MITM Travel Fair 2012 Kuala Lumpur?